AXON can repair and remanufacture virtually any blowout preventor, valve, or choke manifold. 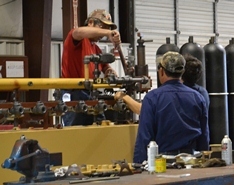 All testing, inspections, welding, and machining are performed in-house or by approved third-party vendors. In addition, all repairs are performed according to API specifications. Document packages are also provided on request and include inspection reports, NDE reports and test charts, as well as MTR’s when applicable.